When the pain is worse than just a headache! Migraines are no ordinary little headache. 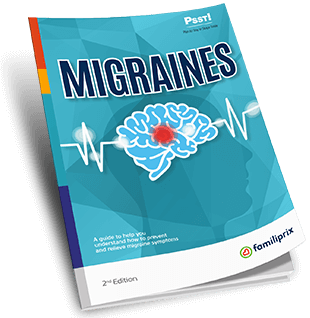 They cause much more intense pain and a number of symptoms that can affect a person’s quality of life, especially when the migraines are more frequent or extremely severe. It can be a struggle to go to work, take care of your house, or even participate in pastimes you enjoy. Some people even develop anxiety about the possibility of having a migraine attack. Unfortunately, it is often difficult for friends and family to understand this phenomenon. How to fight migraine attacks? Go to your local Familiprix pharmacy to pick up a print version of this PSST! guide. It’s free! * Pharmacists are solely responsible for the professional activities performed as part of a pharmaceutical practice and use various tools, including content available from this page.